Peter Austin was born in Edmonton, London on 18 July 1921. He went to Highgate School, followed by the British merchant navy training ship HMS Conway. His father worked for the brewing equipment supplier Pontifex, and his great-uncle had run a brewery in Christchurch. 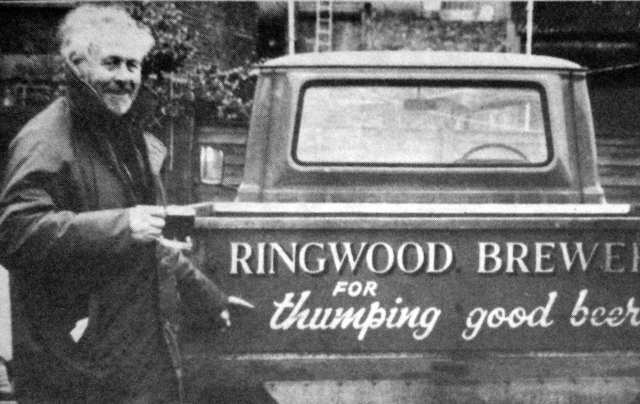 Austin founded Ringwood Brewery in 1978. In 1979, David Bruce started his first Firkin Brewery brewpub in Elephant and Castle, London; Austin oversaw his choice of equipment and the design for its small basement brewery. Austin was the prime mover in establishing the Society of Independent Brewers (SIBA) in 1980, and its first chairman. Under his leadership, SIBA campaigned for 20 years, without the support of any other body, for a progressive beer duty system (smaller breweries to pay less tax on their products) to be introduced in the UK. Such a system was finally adopted by the then Chancellor Gordon Brown in 2002. By the time that Austin had retired from Ringwood Brewery, he had assisted in helping start 40 new UK breweries in a decade. After that, he worked internationally, in the US, France, China, Nigeria, and Russia, among others, building some 140 new breweries in 17 countries. In the US alone, 74 new breweries were built, all using his brewing system. He taught Alan Pugsley brewing, and he went on to found Shipyard Brewing Company in 1994, and later take over Sea Dog Brewing Company. One rain-swept day in 1978 I went to Ringwood in Hampshire to meet Peter Austin and encounter a new concept in beer making: a micro-brewery. At that time brewing was dominated by six giant national brewers who were converting their pubs to keg beers and taking over and closing many of the remaining independent breweries. It seemed unlikely that Peter Austin’s tiny plant in a former bakery would dent the power of the Big Six nationals. But Ringwood Brewery proved to be a catalyst. Camra – the Campaign for Real Ale – had been launched in 1971, its membership had soared and its beer festivals were packed. Rebellion was in the air and Peter Austin, who has died aged 92, was ready to meet the challenge. When he eventually retired from Ringwood he helped set up some 40 new breweries in Britain over 10 years at a rate of one every three months. He then toured the world, repeating the exercise in countries as diverse as China, France, Nigeria, Russia and the United States. In total he built some 140 breweries in 17 countries. Peter Austin was born in Edmonton, north London, and educated in Highgate and on the Merchant Navy training ship HMS Conway. His family was closely involved in the brewing industry. A great uncle ran a brewery in Christchurch while his father worked for Pontifex, a major supplier of brewing equipment. As a result of the Hampshire connection, his first love was boats not beer and he sailed in Poole Harbour during school holidays. He joined P&O from the Conway but contracted TB and had to be invalided home from Australia. He was not fit enough to fight in World War Two and moved into brewing. He did his “pupillage” or apprenticeship at Friary, Holroyd & Healy in Guildford, worked briefly at Morrells in Oxford and joined the Hull Brewery in 1945, where he became head brewer. He left in 1975 following a takeover by Northern Dairies. He moved to Hampshire, bought a boat and took visitors on fishing expeditions. But the brewing bug had bit deep. In 1977 he accepted an invitation from Monty Python’s Terry Jones and Guardian writer Richard Boston – both passionate believers in the concept of small is beautiful – to build a tiny brewery in a former cattle byre at Penrhos Court in Herefordshire. He was back in brewing and a year later opened Ringwood. With business partner David Welsh, he produced Ringwood Best Bitter, Fortyniner and XXXX Porter. The strong ale Old Thumper put Ringwood and micro-brewing on the map when it won the Champion Beer of Britain award from Camra in 1988. Peter was the first chairman of the Small Independent Brewers’ Association (Siba), now the Society of Independent Brewers, which became a powerful lobbying voice for the sector. In 1986 Peter and David Welsh moved from the original site in Ringwood into bigger buildings in the town that had once housed Tunks Brewery. Ringwood was now a substantial business, producing 80 barrels a week for pubs throughout the south and south-west. Peter sold his share to David Welsh and became a consultant, adviser and builder to aspiring brewers in Britain and then worldwide. His biggest impact was undoubtedly in the United States where 74 breweries were built using his brewing system. 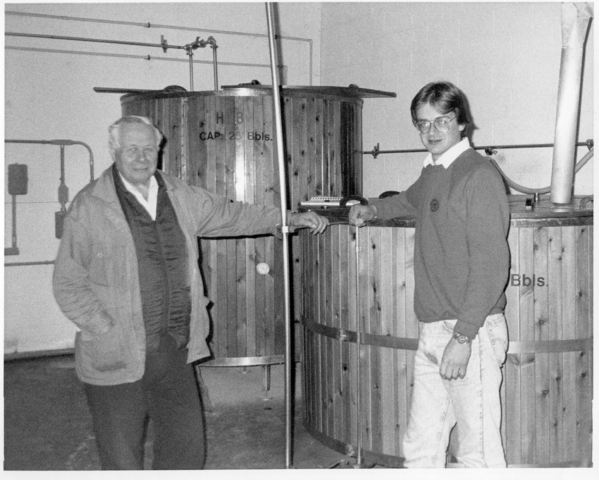 Alan Pugsley learnt the brewing skills with Peter at Ringwood (pictured above with Peter) and emigrated to the U.S. where he helped set up the D L Geary Brewing Company in Portland, Maine, in1986, one of the first new-wave American micros. Pugsley opened his own Shipyard brewery in Portland in 1992 and Peter gave him permission to brew Old Thumper under license. He supplied a sample of the Ringwood yeast culture for authenticity. A new brewery using Peter Austin’s system will open this month at the Four Mile Pub in Victoria, British Columbia — a fitting memorial. Peter Austin married twice. His first wife, Joan, died in 1972 and he married Zena, who pre-deceased him. He had five children, Roland, Jane, Henry (who died in 1992) Jeremy and Sarah, and two step-children, Philip and Leah. His impact on good beer is immeasurable. There are more than 2,000 craft breweries in the U.S., 1,200 in Britain, 150 in Australia, 70 in New Zealand and a growing number in Italy. Beer drinkers have never had greater choice – and much of that is due to Peter Austin. Alan Pugsley at Shipyard in Maine says: “He was an inspiration” and Terry Jones hails him as “the grandfather of micro-brewing”. 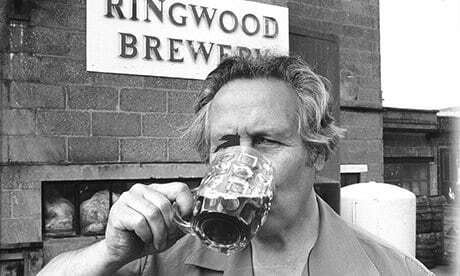 In 1978 Peter Austin opened Ringwood Brewery in Hampshire, England, presenting a new concept in beer making: a microbrewery. At that time in the UK brewing was dominated by six giant national brewers who were converting their pubs from cask conditioned beers ( real ale) to bland filtered keg beers and taking over and closing many of the remaining independent breweries. Rebellion was in the air and Peter Austin was ready to meet the challenge. When he eventually retired from Ringwood he had helped set up some 40 new breweries in Britain over 10 years at a rate of one every three months. He then toured the world, repeating the exercise in countries as diverse as China, France, Belgium, Nigeria, South Africa, Russia, Canada and the United States. In total he and his consulting company built some 140 breweries in 17 countries. He moved to Hampshire, bought a boat and took visitors on fishing expeditions. But the brewing bug had bit deep. In 1977 he accepted an invitation from Monty Python’s Terry Jones and Guardian writer Richard Boston – both passionate believers in the concept of small is beautiful – to build a tiny brewery in a former cattle byre at Penrhos Court in Herefordshire. He was back in brewing and a year later opened Ringwood. With business partner David Welsh, he produced Ringwood Best Bitter, Fortyniner and XXXX Porter. The strong ale Old Thumper put Ringwood and microbrewing on the map when it won the Champion Beer of Britain award from CAMRA in 1988. Peter was the first chairman of the Small Independent Brewers’ Association (SIBA), now the Society of Independent Brewers, which became a powerful lobbying voice for the sector. In 1986 Peter and David Welsh moved from the original site in Minty’s Yard, Ringwood into bigger buildings in the town that had once housed Tunks Brewery. Ringwood was now a substantial business, producing over 80 barrels a week for pubs throughout the south and south-west. In 1990 Peter sold his shares to David Welsh but continued consulting to aspiring brewers in Britain and worldwide. 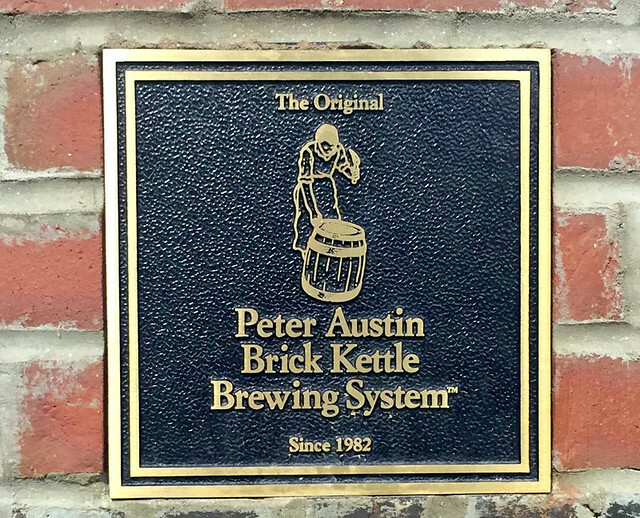 His biggest impact was undoubtedly in the United States where over 75 breweries have been built using the Original Peter Austin Brick Kettle Brewing System. Alan Pugsley learnt the brewing skills with Peter at Ringwood and emigrated to the U.S. where he helped set up the D L Geary Brewing Company in Portland, Maine, in 1986, one of the first new-wave American micros. In 1994 Shipyard Brewing Company was opened in Portland, Maine where Ringwood Brewery gave Alan Pugsley permission to brew Peter Austin’s Old Thumper recipe under licence. Peters legacy is truly alive and well in North America particularly the North East corridor. Peter Austin passed away January 1, 2014 at the age of 92. Peter was a master brewer, Alan Pugsley’s mentor and dear friend. He was a great man, a great brewer, and an inspiration to all whom he touched. His legacy will continue on through the many beers and brewers he inspired around the world. His impact on good beer is immeasurable. There are more than 2,500 craft breweries in the U.S., 1,200 in Britain, 150 in Australia, 70 in New Zealand and a growing number in Italy. Beer drinkers have never had greater choice – and much of that is due to Peter Austin. THE founder of Ringwood brewery Peter Austin – widely credited with saving the microbrewery movement in the UK as well as introducing it to America and popularising it worldwide – has died aged 92. Mr Austin set up the famed brewery in 1978, aged 57. He came from a brewing family; his great-uncle was a brewer in Christchurch and his father worked for Pontifex, which was the leading brewing engineering firm in the country. After school Mr Austin joined the sail training ship HMS Conway and subsequently went to sea with P&O. He was invalided out in 1938 and convalesced before going to Friary Meux Brewery in Guildford to study. In 1944 he worked at Morrells in Oxford and in 1945 he went as third brewer to the Hull Brewery, where he stayed for 30 years, eventually becoming head brewer. But in 1975, disillusioned with the direction of the company after it was taken over by Northern Dairies, he left 30 years of brewing, bought a boat and ran sea-angling trips on the south coast. Mr Austin was approached by Monty Python star Terry Jones and The Guardian beer columnist Richard Boston, who were looking for help setting up a small brewery with Martin Griffiths, the owner of a medieval manor called Penrhos Court and he leaped at the chance to return to brewing. The Penrhos Brewery was established and this inspired Mr Austin to launch Ringwood Brewery, starting with small premises in the old station yard. Business partner David Welsh previously described Mr Austin as “a slave to the mash tun”, often checking his brews in the early hours. In 1982 Mr Austin hired Alan Pugsley to train to brew and work with him on brewery start-ups. They installed more than 120 breweries in 17 countries, including Siberia, China, Nigeria and South Africa. The equipment for the Siberian brewery was lost in the Russian railway system for two years before finally turning up in Dudinka. Mr Austin also helped found the UK’s small brewers association SIBA in 1980. 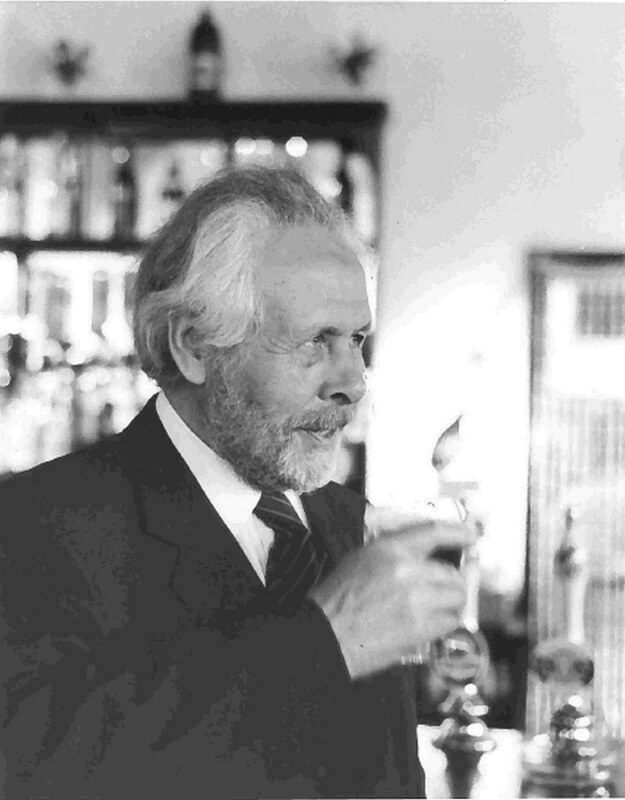 In 1986 Mr Austin moved the brewery to its current location, and retired two years later, aged 67. On July 12, 2007, it was announced that Ringwood had been purchased by Marston’s Plc for £19.2million. Mr Austin’s son Jeremy said: “The family are proud of dad, who was very modest about all that he had achieved. There’s still a functional Austin brewhouse at Stewart’s BC in Bear DE. Kind of a rarity these days.